nudged her new dead chick. She sang her last song. Mick Kulp is a writer, father, and effing bug slayer who is not allowed to buy his own clothes. His creative nonfiction, fiction, and poetry have appeared in numerous consumer magazines, newspapers, literary journals, and three books of poetry. His recent publications are found in Assisi Journal, Gravel, Torrid, Literary Orphans, Yellow Chair Review, Silver Blade, Illumen, Haiku Journal, Broke Bohemian, Chantwood, Folded Word, Georgia’s Emerging Writers, and Gyroscope Review. His complete portfolio can be seen here: http://mickeykulp.pbworks.com). He is a member of the Gwinnett County Writers Guild and founding member of the Snellville Writers Group. In 2018, he created the ‘Books and Beer’ reading series to benefit the local food co-op. 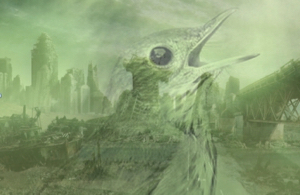 Editor’s Note: The superimposed images of a songbird (from Daily Mail Online) and an apocalypse background (from https://pokeheroes.com/forum_thread?id=32225), echo the irony in the poem. The melancholy is accentuated by the pentasyllabic lines.